Everyone knows that Saturday nights are meant for partying because you can party into the early hours of the morning without having to get up in the morning. But, maybe the last few parties seemed to be getting a little lackluster? The music is almost always the same, the drinks flow, conversations get started and left hanging, and suddenly you start to notice fewer of your friends showing up. Perhaps you need some confetti cannons to liven up the night! Might We Suggest Neon Party Confetti? First, let's set the stage a little. You are planning a Saturday night party to beat all parties, and you want something unique to make it more memorable. So, here's what you need to turn your basic party into something spectacular that no one in attendance is likely to forget. · Lots of everyone's favorite songs and perhaps a DJ to spin them up. · A selection of both alcoholic and non-alcoholic beverages. · Snacks for everyone to munch on. 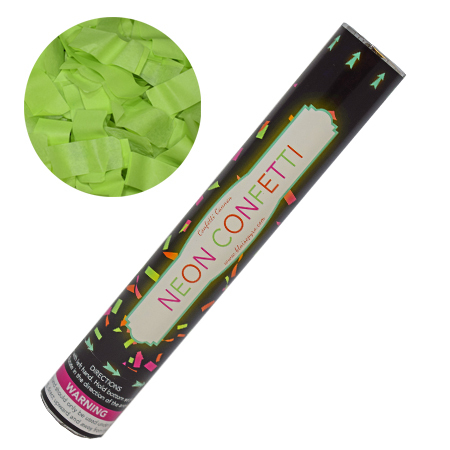 · Oh, and of course a selection of green, pink and orange neon confetti cannons from the Wedding Sparklers Outlet. Our confetti cannons are very simple to use. The user should point their cannon up in the air and away from all guests' faces. Then all they have to do is twist the bottom of the cannon while holding the top and boom; the room is filled with colorful neon party confetti that not only looks amazing under all that black lighting but will cover your guests in what appears to be "glow in the dark" confetti. The hardest part is deciding when everyone should use their confetti cannons. You can randomly shower the dance floor to keep the thrill going all night. Or, instead, why not have preplanned songs where small groups of your guests have to wait for a particular lyric to set off their cannons? Maybe you can start the party off by turning out all the lights but the black lights, give your guests a few seconds for their eyes to adjust and then with a cheer have a few guests fire off their cannons covering everyone in one of the most incredible light and party confetti shows they are likely to ever see. The greens, oranges, and pinks seem to glow in black lighting and cast their reflections all over the room and the guests, creating some amazing images you might just want to take a video of or, at least, a few photographs to share once the event is over. Your guests are sure to love the addition of confetti cannons to your next Saturday night party and will keep talking about it for weeks to come. For more information or to order your neon confetti cannons for your next party, visit the Wedding Sparklers Outlet online or call us at (281) 205 – 8999 and talk to one of our amazing sales team members.